The olive drab Pelican iM3220 Storm Case with Foam is an injection-molded case made of HPX high performance resin, that is virtually unbreakable, dent-resistant and shatter-resistant. It is tough, rugged, lightweight, airtight and watertight. There is a permanently attached Vortex valve that automatically adjusts air pressure without letting in water, and won't unscrew from the case. Press & Pull latches open with the push of a button, yet stay closed securely under impact or stress. The case has unbreakable molded-in hasps that allow the addition of standard size padlocks. It has hinges with integrated feet that hold fast under impact, and create a flat surface for upright stability. It is transported by two double-layered, soft-grip, solid-core handles and rugged in-line wheels. This case has a convoluted foam pad in the lid and four sheets of solid foam in the bottom. 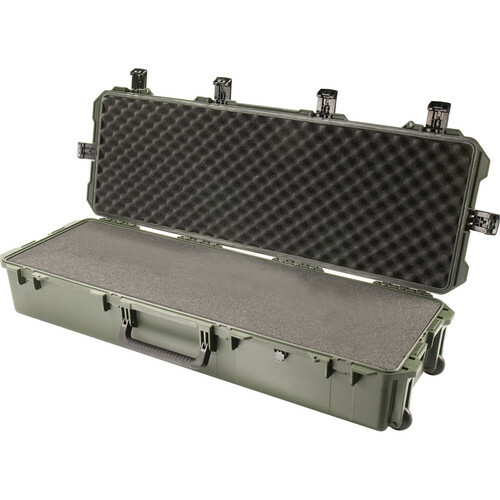 Box Dimensions (LxWxH) 48.5 x 17.5 x 9.5"
iM3220 Storm Case with Foam (Olive Drab) is rated 4.9 out of 5 by 24. Rated 5 out of 5 by Anonymous from Perfect for Trade Shows!!! I recently purchased two of these as the dimensions fit my criteria. These cases were ideal since the majority of the trade shows are out of country. After spending thousands sending smaller boxed packages to and from the events, enough is enough. These cases fit the Air Canada requirements for oversized luggage and we can put up to 50lbs of samples in each. To 'check' this size luggage would only be $100 round trip. A huge money saver. Product was shipped to Canada and it only took 3 business days for delivery. I will order from B&H again!! Rated 4 out of 5 by haugstad. from Great case, but easily scratched This case get ugly very fast, after three flights it is very ugly on the flat surfaces. The foam is easy to cut, just don't use a pointy blade knife, a scalpel with curved edge will make a much nicer cut in the foam. Rated 5 out of 5 by Anonymous from Solid, sturdy case. I am a location sound recordist and use this case to get field recording gear to and from film and video production locations. It holds everything I need securely. You can use an electric knife (the filet version is best) to carve the foam to fit each piece of gear. Voila! A complete field sound production kit in a watertight, airtight, solid case. The case is well-engineered, well-made, and well worth the price. Rated 5 out of 5 by Ragnar from A tough case! The case was a little heavier than was expecting. It is a tough product, if you need to protect sensative equipment during transporting this is a great item. I have no qualms about placing expensive photographic equipment in the hands of the airline baggage handlers any longer. It was not difficult in shaping the foam padding, I used an electric carving knife and it worked well. Rated 5 out of 5 by Anonymous from Great Case Excellent case. I'm using it to store/transport a Celestron 130SLT Telescope and its goto motorized mount. The case came with foam, but not the pick-n-pluck foam, so you'll need to cut the foam yourself. I found the best way to cut it is to use a sharp, heated (with a torch) knife. Rated 5 out of 5 by James from Perfect Case Well constructed and holds six heavy duty folding light stands with room for six power cords and small electrical convert boxes. Best investment I have made for making my studio mobil. Lots of protective foam provided as well. Roller wheels are smooth running - up hills and steps. Rated 5 out of 5 by Anonymous from iM322o Storm case with foam is a buy bought this for anything that would need protection while taveling. it is big, but, i cannot imagine anything getting damaged, even in the least while in this case. i had forgotten about the wheels, but they came in real handy the first time i used it. Rated 4 out of 5 by Anonymous from Storm case iM3220 This case has proven to be as tough as they claim. Removing the foam and using a soft case makes this a great travel case for several firearms and accessories. Only drawback is its size when you dont have a large storage area in your vehicle. Will this case fit Celestron sky prodigy 130? Just do the measuments guy..... look at the inside measurements and measure your stuff. #rocketscience I know. I have this case and it's awesome. You can get it without or without foam. Asked by: Mary Ann H.
The foam is removable. It is not glued in. Will it fit with Manfrotto MT055XPRO3 Aluminum Tripod+ Manfrotto 502HD Pro Video Head ?